The game of basketball offers a unique scoring opportunity that simply can’t be found anywhere else in sports: the free throw. This motion doesn’t cloak its true meaning in verbose vernacular. In fact, it’s exactly what it claims to be: An uncontested throw of the ball at the hoop in hopes of adding another point, two or even three to your final total. No defender trying to block or even affect the shot, other players reduced to fans watching the action unfold in front of them. It’s a play that’s become so commonplace in the game today that we often overlook its simplicity. Delving into WNBA team free throw percentage from the past five seasons, a veiled but intriguing theme of consistency comes to fruition. From 2013-16 the Chicago Sky never dropped out of the top four, and this season the Mystics are the second team shooting 85% or better (Fever, 2017) since the 2011 Phoenix Mercury. The thread clearly isn’t a homecourt advantage but rather a prolific individual shooter: Elena Delle Donne. You know about the MVP awards, the scoring champion accolades, the Rookie of the Year trophy and the Olympic gold medal, but EDD also holds the profound honor of being the league’s all-time leader in the free throw percentage (94.3%). Delle Donne has made the charity stripe her second home. While her exceptional arsenal of offensive weapons make her lethal off the dribble or in a catch-and-shoot opportunity, her ability to draw fouls and then convert from the line is what sets her in a class all by herself when it comes to stuffing the stat sheet. On Tuesday afternoon, Delle Donne tied DeWanna Bonner’s record for consecutive made free throws in a single season at 59. Eva Nemcova still holds the all-time record after sinking 66 straight between the 1999 and 2000 seasons. She missed the historic shot and fell short in chasing more history, but still, this ground-breaking level of consistency was nothing new for the four-time All-Star. 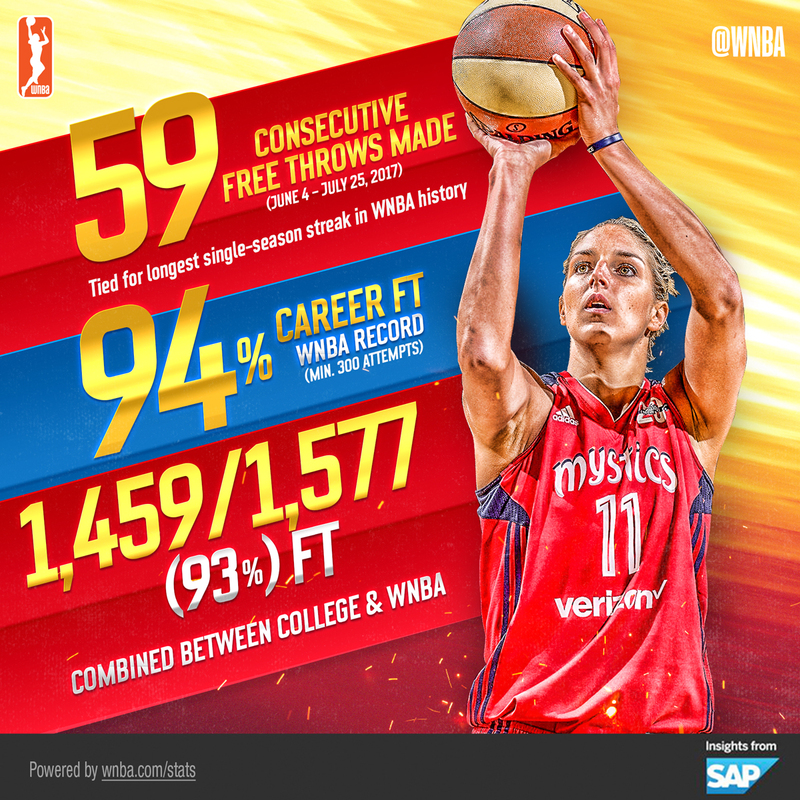 In 2015, Delle Donne made 58 straight free throws as a member of the Chicago Sky, which at the time set the all-time single-season record before Bonner set the new record just five weeks later. In the same season she also set a new WNBA in-game record by knocking down 19 of 19 free throws against the Dream in late June en route to a career-high 45-point outburst. All in all she’s made an astounding 686 of the 728 total free throw shots she’s attempted in her WNBA career thus far. 2017 has been particularly special for the free throw phenom as her 96.4 percent shooting from the line is the best clip of her career. EDD has only missed four free throws this entire season, she’s taken 112. Always mentioned in the scoring champion discussion, Delle Donne’s 19.3 points per game are the 7th most in the WNBA and of her 366 points this season 108 have come in the form of free throws. Many are hesitant to say that someone is “automatic” or a “guarantee” when it comes to scoring the basketball. But, if Elena Delle Donne is on the line with two free throws coming her way, it’s safe to assume she’ll have two more points next to her name as her team runs the other way to get into their defensive set.